Upon arrival at Mariscal Sucre International Airport, OARS will arrange your transfer to our hotel. If you’d like to explore the city of Quito, OARS can arrange a day tour, or you may want to consider spending additional nights in the city before or after the Galapagos program. We usually spend part of a day on the great white sand beach at Gardner Bay. This is the place where you can have time alone to reflect, take a long walk, jog in the surf, swim, snorkel or stretch out on the sand for a snooze. Sea turtles nest on this beach and sea lions conduct helpful snooze workshops as part of their compelling “Live Like a Sea Lion” programs. Enjoy the views of Islote Gardner, a small island in front of Gardner Bay lined with vertical cliffs that drop to sandy ledges and large boulders. Islote Osborn is a small Island, about 3 km from Española Island, perfect for swimming and snorkeling, if park regulations allow. Leon Dormido, well known as “kicker rock,” is a huge monolith that split apart creating a narrow passage that only the most skillful yacht captains can negotiate. Blue- footed Boobies and Magnificent Frigatebirds nest along the ledges. This location offers an absolutely amazing venue for deep water snorkeling and often provides an up-close and personal encounter with rays and sharks. We spend a fascinating half-day on Santa Fé, the island home to a small population of very large land iguanas, and the largest of the Opuntia cacti. The lagoon appears like a scene from “South Pacific” and is ideal for swimming and snorkeling; sea lions and colorful fish abound here and sometimes we see sea turtles. You may snorkel from the beach to the yacht with your guide, provided the bull sea lions are not overly aggressive. The climb to the bluff is challenging but the payoff comes when you spot a couple of huge land iguanas. This is a lovely, restful site. On arrival in Darwin’s Bay, a protected bay in a volcanic crater that long ago broke open to the sea, we host a “welcoming committee” of juvenile Red-footed Boobies. They come on board to inspect us and perch on the railings (the crews love this!). On the beach we can observe these entertaining tree-nesting Red-footed Boobies, displaying male Great Frigatebirds, mockingbirds, Swallow-tailed Gulls and finches. At certain times of the year, the male frigatebirds sit in the green salt bushes with their great red, chest pouches all puffed up, looking skyward. Any time a female flies over, they put on a compelling show of yodeling, wing flapping, and beak waving, always with great hopes that they will be chosen by the passing lady! This season generally runs from February to May. There is always great commotion on this island as the nesting Red-footed Boobies are being constantly hassled by the kleptoparasitic frigatebirds for both their food and nesting materials. At Sullivan Bay, just across a narrow channel from Bartolomé on the eastern end of Santiago, you will walk on recent, black pahoehoe lava flows. You will see some of the early colonizing plants—mollugo and brachycereus—struggling to gain a foothold in tiny cracks in the lava. Small cinder cones stand out where this black blanket flowed gracefully around them. You get a sense of the primordial, the beginnings of the planet, as you wander around on this primitive flow. Occasionally, a colorful Galápagos Grasshopper (actually a locust) flits ahead of you, over the flow. You may wonder how it makes a living out in this austere environment. This is a “small red island,” the color of the volcanic cinders. It is located just across a small channel from the south side of Santiago, near the center of the archipelago. The red beach is usually well populated with sea lions and pups. At times the low salt bushes are loaded with nesting California Brown Pelicans. It is amazing that pelican chicks are just as bizarre looking as their parents. Just behind the beach, in a brackish lagoon, we usually see Bahamas White-cheeked Pintail Ducks, migratory shore and wading birds, and Greater Flamingos. Flamingos need the presence of a dozen or two other flamingos to stimulate their synchronous mating dance. With some luck, we will be able to observe this highly entertaining ritual. Two species of boobies nest along the cliffs. The snorkeling is very good along the cliff face where Galápagos Penguins may swim with you; you can count on swimming with sea lion youngsters. Our arrival back to the Quito area includes a return transfer to our hotel. 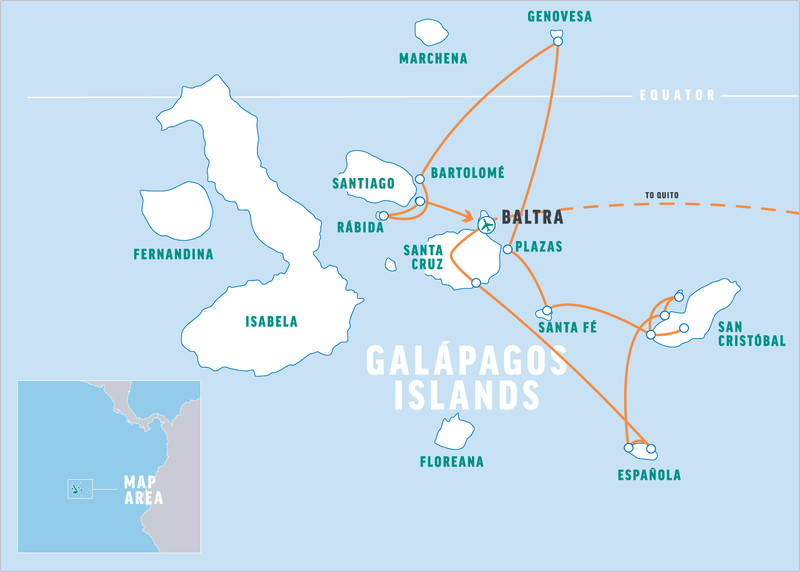 The remainder of the evening is yours to relax—perhaps you’ll need a rest from an action-packed week exploring the Galápagos Islands! Dinner is on your own. For those with a departing flight this evening, the hotel staff can assist you with arranging your transport to the airport. From the world’s only seagoing iguanas to flightless cormorants and penguins, flamingos, inflatable frigate birds, wave albatrosses, clownish boobies, patriarchal giant tortoises, and 13 species of Darwin finches, you can enjoy thrilling encounters with animals—up close and in large numbers—who are completely at ease among human visitors. Your stateroom will be cleaned on a daily basis. Towels are replaced as needed, while linens will be changed once in the middle of the cruise. Soap, shampoo and a hair dryer are provided. Please do not bring any food or drinks into the cabins in order to avoid bad odors and insects. We need to know as soon as possible about any dietary restrictions we should consider in planning your trip. If you have additional food allergies or necessary restrictions, we will do our best to accommodate your needs. Beyond our standard menu, we can provide options for vegetarian, vegan and many allergy-restricted diets. However, we cannot always provide the same diversity or sophistication for restricted diets as sourcing special ingredients in the Galápagos can be challenging.